Here's a way to reduce the antenna weight and make it a plug-in type. This is a way to install connectors between your receivers and the antennas in your gliders. 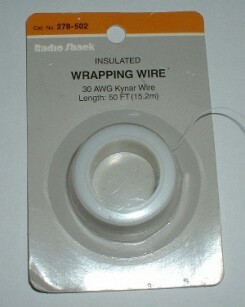 To reduce weight (especially for a DLG) I use very thin wrapping wire from Radio Shack. The thinness of the wire, compared to the antenna wire that comes with receivers, has no detrimental effect on range. 1. Measure the stock antenna from where it exits the receiver case to the end of the antenna. 2. Cut the stock antenna, 2.5 inches from the receiver case. 3. Cut a length of wrapping wire equal to the original antenna length minus one inch. 4. Strip 1/4" insulation from the receiver end of the antenna. 5. Strip 1/2" insulation from one end of the length of wrapping wire. The wire is so thin that I double it up to make a 1/4" end. The d-type connectors are designed to be crimped on the end and in a central area. I crimp the end, but I prefer to solder the wire in the central area. 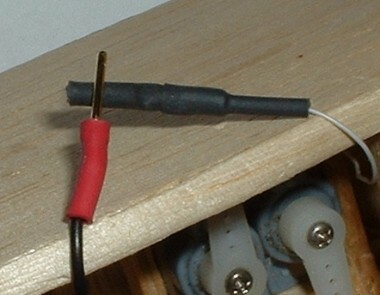 This is more necessary for the wrapping wire lead, because it is so small that it would be difficult to effectively crimp it into the connector. 6. Put the stripped receiver wire end into the male connector. Crimp the end of the connector by squeezing the small tabs down onto the wire. Put a small amount of solder into the channel. 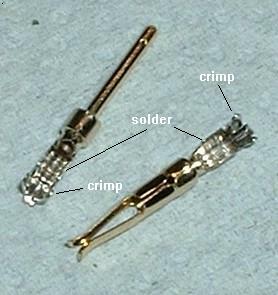 Place a 1/2" length of shrink wrap tubing over the crimped and soldered portion of the male connector leaving the probe part exposed. 7. Repeat step 6 with the female connector and the doubled over wrapping wire lead. 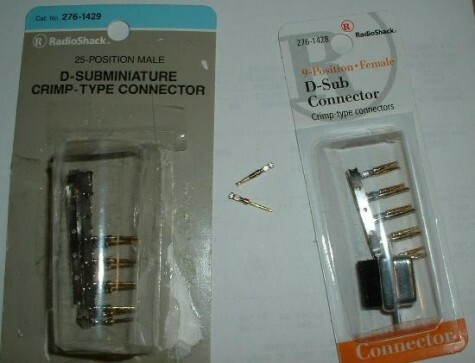 When you shrink wrap the female connector, use a longer piece of shrink tubing and cover the entire connector plus at least 1/4" of the wire lead out of the connector (to reduce the likelyhood of the wire breaking from bending fatigue). 8. Plug the antenna together and measure the length. Cut the end of the antenna to make the total length of the new antenna equal to the original antenna. I put a piece of tape around the joint to keep the connection secure. Be careful when crimping the female connector onto the wrapping wire. Don't overdue with pressure or you will break the wire. If you want to, you can glue the female connector to some part of the fuselage, but If you don't put it in the right position, it can be difficult to plug or unplug. If you add connectors to all your receivers, you can swap receivers very easily.